Here’s a great diagram of the cross section of a baseball. If you’ve never taken apart a baseball, it’s a fascinating experience (not to mention long and sticky). Baseballs definitely have more interesting features to them than the inflated rubber you find in a lot of sports. And here’s a photo of the outside of a ball during the various stages while it’s getting made. 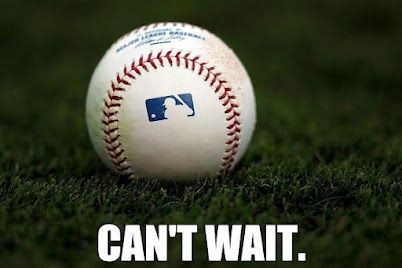 Pitchers and catchers report two weeks from today! Stan Musial became the first player signed to a six-figure contract in National League history on January 29, 1958 when he signed a $100,000 deal with the Cardinals. Musial had been willing to accept less, in spite of winning his seventh batting title by hitting .351 in 1957. The Cardinals, however, felt that he deserved the contract, which represented Musial’s first raise in seven years. Today, Negroes play on every big league club and in every minor league. With millions of other Negroes in other walks of life, we are willing to stand up and be counted for what we believe in. In baseball or out, we are no longer willing to wait until Judgment Day for equality – we want it here on earth as well as in Heaven. This seems about right. Technology sure has changed things. Still, it is nice to have so many ways to keep in touch with the game. In a recent browsing session through the public library, I came across this book by Tom Stanton: Ty and The Babe: Baseball’s Fiercest Rivals: A Surprising Friendship and the 1941 Has-Beens Golf Championship. Tom Stanton is a journalist and associate professor of journalism at the University of Detroit Mercy. Ty and The Babe was a finalist for the Quill Award in 2007. Naturally, I chose to read this book because of its coverage of two great figures in baseball, though, as one might guess from the title, the book is almost as much about golf as it is about baseball. The book covers the rivalry between Ty Cobb and Babe Ruth during their baseball careers, which simmered to a sort of grudging respect by the time Cobb retired. Years after both their baseball careers had ended, Cobb challenged Ruth to a golf competition, which Ruth accepted. As America made its way into the 1920s, Babe Ruth burst onto the baseball scene as a power hitter on the field and a late-night carouser off the field. Everything about the Babe’s style of play and personality clashed with that of Ty Cobb, who was comparatively meticulous about his self-care, his preparation, and his in-game approach to baseball. Furthermore, Ruth’s presence in the game now threatened Cobb’s claim to being the best player in baseball. Cobb represented an older style of baseball, which revolved around more of a “small ball” approach involving bunting, stealing, and effective base running, while Ruth represented the newer, flashier, slugging style that now took the country by storm. The early relationship between the two ballplayers was laden with jealousy, pettiness, and mind games. When facing one another on the diamond, the two snarked and jabbed at each other constantly, at times going out of their way to do so. The book covers a number of their encounters, bringing them to life on the page with a level of detail that makes them seem like they happened just last week. Over time, Cobb was forced to acknowledge that Ruth understood baseball at a much deeper level than just a platform for displaying his brute strength and garnering attention. Though the two men continued to compete with one another, they also came to respect each other, and even acknowledged this respect publicly. By the time Cobb retired from baseball, the two even had seemed to become friends. I struggled a bit with the last portion of the book, which revolved around the golf competition between Cobb and Ruth. This isn’t a knock on Stanton’s writing so much as a reflection of my own indifference to the game of golf. The descriptions of the approaches and personalities of Ruth and Cobb continued to captivate my attention, but when details about the actual golf matches became the focus of the narrative, I confess that I largely skimmed through those parts. Perhaps what I enjoyed most about the book came in Stanton’s refusal to demonize Cobb in the manner Cobb often gets portrayed in baseball histories. Not that Cobb was without his flaws, Stanton acknowledges, but contrary to popular belief, he did have friends and he never actually sharpened his spikes. The image of Cobb as a fierce, hard-sliding, no-holds-barred ballplayer started, for the most part, with his autobiography, ghostwritten by Al Stump, and perpetuated through popular culture. In spite of the golf, I have to say that I’m thoroughly pleased with this book and I certainly don’t regret reading it. Stanton presents a refreshing look at both these ballplayers, and looking at each of them through the lens of their relationship with one another offers a fun perspective. Congratulations to Chipper Jones, Vladimir Guerrero, Jim Thome, and Trevor Hoffman on their election into the Baseball Hall of Fame!